This month and leading into the March Equinox is the ignition of the Masculine Divine Pathway that is made possible through the Equinox Solar Light Body Gateway. She explains that for the first time in the Ascension Timeline of the New Earth & New Humanity, the masculine energies are re-appearing to merge with the divine feminine pathway. Updates include a new Ascension Grid of Safety and Peace and what this means for the Masculine Divine pathway. 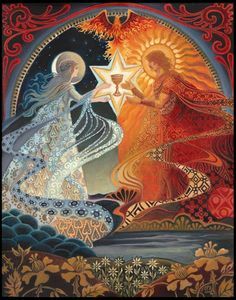 The Equinox will usher in a reboot to the Earth Hive, the New Earth’s grid, enable the full embodiment of the Solar Light Body of the Sophia-Christ Consciousness through the Heaven on Earth Higher Heart Bridge. To participate in Corrina’s Equinox transmission, Register for the Bridging Heaven on Earth Transmission HERE. ******************************************************************************************************************************* Join us on the 15th of each month for an Energy Transmission & Healing call. Sign up for the Our New Humanity Newsletter. Receive New Humanity Energy Transmissions, high vibrational products & New Humanity Press Communications at the New Humanity Store. Reblogged this on New Humanity Press Daily.